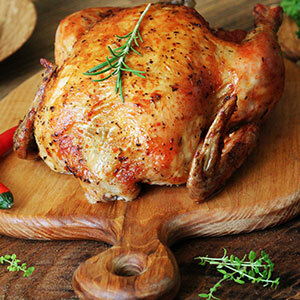 Free up space in your oven by cooking the Thanksgiving turkey on your gas grill this year! Prepare your gas grill by brushing olive oil on grates. Then turn on to a medium heat. Turkey needs to be completely defrosted. Clean out the cavity of the turkey and pat dry inside and out. Place turkey, breast side down, on the prepared grill. Sear turkey on both sides until skin is a golden brown. Once turkey has been seared on both sides, brush butter all over. Place the turkey breast side down in the roasting pan scooping the pan mixture over the turkey. Cover tightly with foil and place on grill. Grill 3-4 hours, until the internal temperature of the thigh reaches 180 degrees Fahrenheit. Remove turkey from grill and let stand 10-15 minutes before carving.